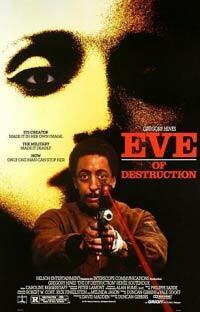 Eve of Destruction (1991) - Sci-fi-central.com.  USA  1991  99m   Directed by: Duncan Gibbins.  Starring: Gregory Hines, Renée Soutendijk, Michael Greene, Kurt Fuller, John M. Jackson, Loren Haynes, Nelson Mashita, Alan Haufrect, Maryedith Burrell, Norman Merrill, Craig Hensley, Greg Collins, Eddie Matthews.  Music by: Philippe Sarde. I went to see this movie on impulse during its (very) short run in the theaters, not hoping for much more than a hidden gem or a quirky little film. It had Gregory Hines in it (who was great in "Running Scared" a few years earlier) and it had a fairly attractive blond playing a Terminator type, so how bad could it be? Well, I found out. When I came out of the theater, I was angry and annoyed; I didn't want my money back, I wanted the two hours of my life I wasted watching it back. When I saw it was showing again on cable many years later, I sat down to watch the final 20 minutes to see if I still hated it as much. I seemed to have mellowed towards EOD somehow in the intervening decade. On the small screen, it was OK, at least for the last 20 minutes. Not "Star Trek: TNG" OK, or even "Blake's 7" OK, but watchable; say, on a par with one of the products of the endless sausage factory of hackwork films you see on the Sci-Fi Channel, or "Roger Corman Presents" on Showtime Beyond. I feel badly for the Dutch actress whose career in the States was torpedoed by this mess. She is out of her element here, as is poor Gregory Hines, who I imagine grabbed his paycheck and ran, and hoped no one ever mentioned this movie again. And probably the original screenwriter, who hoped to advance his career with a decent premise, only to see all the life sucked out of his screenplay, went back home for a three week drinking binge. The problem with this movie, as I see it, is that the director really didn't know what he was doing, and didn't know how to get the performances he needed from his cast. And he didn't seem to understand the requirements of an action movie with futuristic elements. There were many potentially nice moments and lines of dialog which should have bubbled and popped like good champagne. Instead, they just sat there on the screen like stale tonic water - kind of like "Attack Of The Clones", come to think of it. The action and fight scenes were also underwhelming, badly paced and staged, and didn't live up to their potential - what should have been visceral and invigorating just thudded along without ever drawing in the viewer. Blond Netherlands Actress Lady, I hope you found happiness and fulfillment in some other manner, maybe on the stage or in European cinema. Gregory Hines, rest in peace; we won't think of this movie when we remember you, but instead will remember you as a great hoofer who got to play alongside Baryshnikov and Billy Crystal.